Below you fill find all funeral homes and cemeteries in or near Cavalier. Suburbs of Cavalier: Akra, Backoo, Cavalier AFS, Concrete. Cavalier is also known as: Pembina County / Cavalier city. Zip codes in the city: 58220. Some of the notable people born here have been: Robert Hunt (american football player). Cavalier is a city in Pembina County, North Dakota, in the United States. It is the county seat of Pembina County. The population was 1,302 at the 2010 census. Cavalier was founded in 1877 and became the county seat in 1911.Although they bear the same name, Cavalier is not located in nearby Cavalier County. The Tongue River flows past Cavalier and Cavalier Air Force Station is located near the city. It was reported by San Diego Union-Tribune on June 10th, 2018 that Dean Michael Clairmont died in San Diego, California. Clairmont was 63 years old and was born in Cavalier, ND. Send flowers to express your sorrow and honor Dean Michael's life. It was disclosed by The Bismarck Tribune on October 14th, 2016 that Daniel Sr Many Ribs passed on in Cavalier, North Dakota. Many Ribs was 52 years old. Send flowers to share your condolences and honor Daniel Sr's life. It was revealed by The Bismarck Tribune on October 6th, 2016 that Harold "Inch" Goudreau passed on in Cavalier, North Dakota. Goudreau was 57 years old. Send flowers to share your condolences and honor Harold "Inch"'s life. It was revealed by Register Guard on September 14th, 2016 that Joseph Eugene "Gene" Reopelle passed away in Springfield, Oregon. Reopelle was 85 years old and was born in Cavalier, ND. Send flowers to express your sorrow and honor Joseph Eugene "Gene"'s life. It was noted by The Bismarck Tribune on May 16th, 2016 that Darren Loans Arrow died in Cavalier, North Dakota. Loans Arrow was 49 years old. Send flowers to express your sympathy and honor Darren's life. It was reported by The Bismarck Tribune on October 14th, 2015 that Vernon L Scott passed on in Cavalier, North Dakota. Scott was 80 years old. Send flowers to express your sorrow and honor Vernon L's life. It was revealed on August 25th, 2015 that Stanley H Morrison died in Carmel, Indiana. Morrison was 84 years old and was born in Cavalier, ND. Send flowers to express your sympathy and honor Stanley H's life. It was revealed on July 17th, 2015 that Karhryn M Wolf died in Las Vegas, Nevada. Wolf was 50 years old and was born in Cavalier, ND. Send flowers to share your condolences and honor Karhryn M's life. It was reported on April 10th, 2015 that Karolina Elenore Dovenmuehler (Hungate) passed away in Staples, Minnesota. Ms. Dovenmuehler was 75 years old and was born in Cavalier, ND. Send flowers to share your condolences and honor Karolina Elenore's life. It was revealed by Grand Forks Herald on March 30th, 2015 that Andrew C Hiebert passed on in Cavalier, North Dakota. Hiebert was 97 years old. Send flowers to share your condolences and honor Andrew C's life. The population was 1,537 at the 2000 United States Census census. 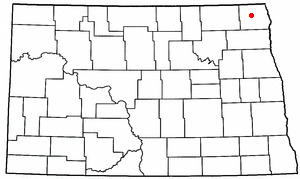 Cavalier is a city in Pembina County, North Dakota County, North Dakota in the United States. It is the county seat of Pembina County . Cavalier was founded in 1877 and became the county seat in 1911. . The official website for the city of Cavalier is http://www.cavaliernd.com/. They lived in Hensel for a short time before moving to Cavalier. George was drafted into the United ... Arrangements with the Aaker Funeral Home, Lakota, ND. funerals in Cavalier, ND 58220 on Yahoo! Local Get Ratings & Reviews on funerals with Photos, Maps, Driving Directions and more. Find funeral directors & Funeral Directors in Cavalier, ND. Read business reviews, find driving directions, and more. funeral directors on YELLOWPAGES.COM. We work with local florists and flower shops to offer same day delivery. You will find budget sympathy flowers in Cavalier here. Our funeral flowers are cheap in price but not in value.